The Feed in Tariff pays you to generate your electricity, and to export, but for most people their export is ‘deemed’ at 50%. That is to say, you get paid for export regardless of whether you actually export any of the generated power. 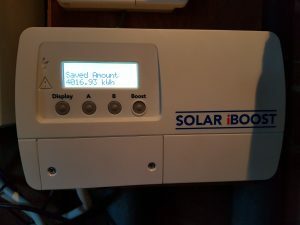 It is, therefore, in your best interest to use as much of the generated power as you can, and many people try to use their power hungry appliances to make the most of their free electricity during daylight. What if there was a way to store any unused generated power, rather than export it? You could use the excess power to heat your water for free. This reduces your heating bill and also reduces wear and tear on your usual heating appliance (boiler or heat pump). 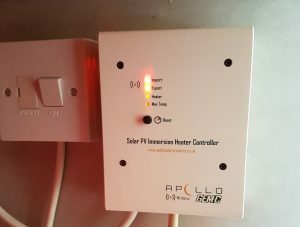 Immersion heater controllers use a sensor on your incoming meter tails, which automatically monitors the direction of the electricity supply to the building. Any surplus is automatically diverted into the immersion heater. Most immersion heaters use a 3kW element, but here’s the clever bit… the immersion controller can adjust its output so only the would-be export is put into the immersion heater. There are various makes and models of immersion controller and each have their own features. Some can connect to more than one load, e.g. two immersion heaters, or one immersion and a towel rail. Some are wireless, which can simplify installation in some circumstances. The blue line shows the temperature of the hot water cylinder. The red line shows the electricity that the controller is diverting instead of allowing it to be exported. It varies all the time as the generated electricity and the household usage go up and down. You can see how the cylinder temperature increases from 14° at 11am to 50° by 4pm.